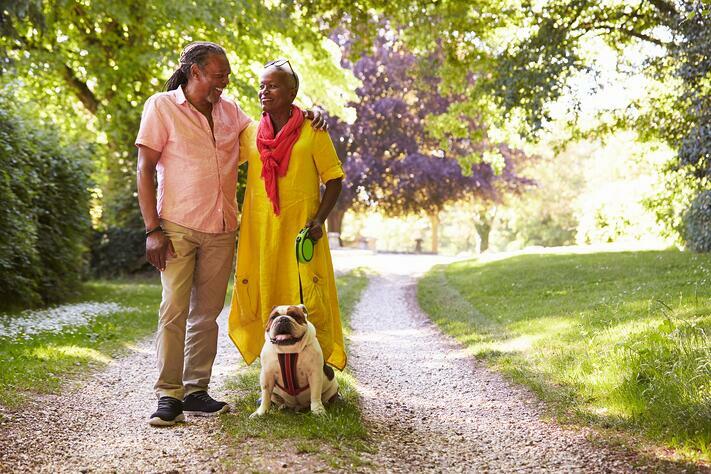 Dogs make excellent companions, and that’s especially true for seniors. Not only will a dog provide love and affection to his owner, but dogs can help to keep older adults active thanks to their daily exercise requirements. Study after study shows the benefits of dog ownership for seniors, from improved mood and physical fitness, to reducing stress and perceived pain levels. When looking for a dog for an older adult, whether you’re searching for a dog for yourself or a loved one, there are several factors to take into consideration. Size - You don’t want a dog that is going to be so large as to potentially cause injury, but you also don’t want a pet that’s too small and might be tripped over. Strength - A powerful dog could easily pull her owner and cause injury. Choose a pet that has not been bred for working. Temperament - Aggression or fear can be dangerous for dog owners, and this is especially true for seniors. Try to find a pet with a calm, laid back personality. Health - Some breeds have more health issues that others. Be aware of any breed-specific needs such as hip dysplasia, skin infections, or early blindness. Age - A high-maintenance puppy may not be the best choice for a senior citizen, and an aging pooch may be too slow for a more active senior. Try to find a pet who matches your activity levels. Cost - Getting a dog from a breeder will cost more than from a rescue, though they often guarantee temperament. You’ll also need to factor in the cost of food, grooming, and regular vet visits when deciding on a pup that best suits your needs. With the above information in mind, here are 10 of the best dogs for seniors. Poodles come in small, medium, and large sizes to suit any living situation, and have been well-regarded over the years for their calm, gentle, loyal personalities. They are incredibly smart and easy to train, and while their coats do require regular grooming, they are hypoallergenic. Another hypoallergenic option, the Maltese is known as a gentle yet fearless pup who loves to spend time with his people. They are frequently used as therapy animals due to their easygoing, pleasing nature. Because of their small size, they are ideal for those living in apartments, and require just a moderate amount of daily exercise. These lively little dogs are highly intelligent, making them easy to train. They boast gentle personalities, but can be quite protective of their owners. They also tend to be quite vocal dogs. They do best with a long daily walk and regular brushing. They are typically friendly around children and are well-suited for apartment living. Very smart and affectionate, the Bichon is known for being loyal and easy to train. They are incredibly obedient and love spending time around their people. Their coats do require a regular trip to the groomers, but they are hypoallergenic. A daily walk should be enough to meet their exercise needs. An easygoing companion, the French Bulldog (or Frenchie) is a playful, obedient canine. They are generally quiet and get along well with people and other pets. They are great for apartment-dwellers, and their short coats require very little in the way of grooming. Like poodles, Schnauzers come in a variety of sizes to suit any living situation, and are quite trainable. They get along well with people, kids, and other pets, although they can be possessive of their owners. They require a moderate amount of daily exercise, which can help keep their owner moving as well. This happy-go-lucky breed loves nothing more than to spend time curled up on the couch with their owner. They are playful and friendly, and require very little in terms of grooming. A bit of a clown, this pup will need a daily walk in order to burn off all their energy. The Yorkie has a long history as a companion pet, and it’s not hard to see why, given their small size and love for people. They will require regular grooming (although they shed very little) and daily walks to keep them in top health. They are easy to train and easily adapt to apartment or assisted living life. They may be small in size, but the Pomeranian does not lack in personality. They are playful and energetic, and are incredibly driven to please their master. They are lightweight and enjoy cuddling up on the couch, and due to their intelligence are easy to train. Regular visits to the groomer are a must for this pup, as is a consistent leadership style to prevent them from taking over your house – but they make wonderful companions for small-space living. Taking time to consider your lifestyle, the time commitment and costs involved in caring for a dog, and the typical characteristics of these and other breeds will help you select the perfect companion for your golden years.